Two weeks ago, I wrote a paean to petunias and how they liven up the street scene in Wooster Ohio. 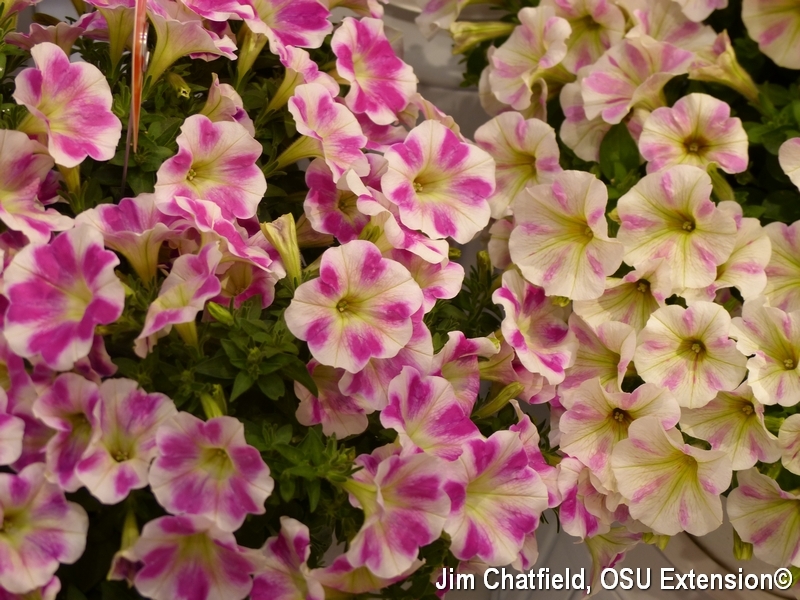 This week, I got a second dose while traversing the trade show floor at Cultivate’16, the summer festival of flowers and floricultural and all horticultural education put on by American Hort at the Columbus Convention Center. There were of course many more attractions as well as petunias. Yet, this among many, all my life I have waited for flowers such as these. Below are just a few to whet your petunia palette with what is here now and with what is to come of new varieties. Get thee to garden centers, to catalogues over the winter, to OSU trials in Columbus and in Springfield, and to your landscape architectural drawing boards virtual and otherwise. Magnifique. Botanical note: as noted earlier, Petunia is a genus in the Solanaceae family. Fellow genera in this family include tomato and tobacco, potato and peppers, sweet bell peppers and chili peppers (Capsicum spp.). Petunias originated in South America and love hot conditions, like their Red Hot Chili Peppers…er I mean red hot chili pepper…cousins. As Voltaire might have said: cultivate your (petunia) gardens. And, Aujourd'hui, nous sommes tous français. Stay tuned for Cultivate’17, scheduled in Columbus for July 15-18, 2017.